Preheat oven to 325 degrees. Line a baking tray with non-stick tin foil. In a large bowl mix together: raisins, almonds, coconut, cornflakes, and sweetened condensed milk. Make cookies by placing a scant 1/4 of a cup the mixture onto the foil lined oven trays. 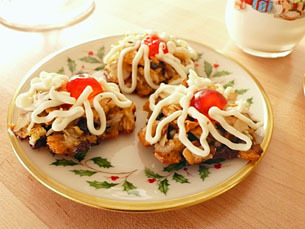 Cut the candied cherries in half and put 1/2 of a cherry on each cookie. Bake the cookies for 14-15 minutes or until light golden. Let the cookies cool for 5 minutes before removing from them from the tray. Put the dark chocolate into a small bowl and melt it in the microwave. Put the white chocolate chips into a small baggie. Set the baggie of chocolate chips into a bowl of hot water to melt. Wow, those cookies are really something! This is the greatest video, congratulations … I love the Rudolph pushing the traditional cookie ingredients away! that’s priceless !! Thanks Will! We had great fun making this video, and the cookies are really chewy and delicious! I love the way you melted the white chocolate straight into the “piping bag” so much less wastage than conventional double boiling. Very cool! and it makes cleaning up so easy! I’m a university student who recently started living away from home. I love experimenting with new recipes but am still learning a lot of the basics. Your site is beautiful and helpful, and I am so glad I stumbled upon it today. I will surely be visiting again. I like the videos ;D you are a good teacher ;D.
The song is very good =$. Wow – you are incredibly patient to put together this video. Great job! Thanks Everyone! I’m glad to be of help! I’m having the time of my life working on both the videos and the photo-tutorials! Thanks David! It looks like you and Matthew did a great job making Rudolph’s Cookies! Your website has kept e from starvation! I am a college student and i have to say I wouldve never survived without you! so thanks! Hi Kathy. Can you do this recipie without the almonds? I have an allergie to all nuts and these look very delicious. Thanks! This looks so delicious and the video was interesting and has a great stuff.Sure will try and taste it as soon as possible. Good luck with your studies Wishopeace! Zoe, Just add a bit more cereal instead of the almonds. I love your recipes! I was wondering if this one could be done without coconut or by using something else in its place? I love coconut so I have never tried to make these cookies with it. It not only adds flavor but also adds to the chewy texture. You can try making these cookies with out it, but I would add a bit more of the nuts and cereal instead. I have never heard of non stick tin foil… I will have to look for it.. These cookies look to beautiful- especially around the holidays. Thanks for another winning recipe. The holiday season is here – time for Christmas cookies. This recipe video shows you how to make these special treats. They remind me of Rudolf and so I thought I would call them Rudolf’s Christmas Cookies. I hope you like them. Enjoy!